April 5, 1937 Colin Luther Powell, the first African American United States Secretary of State, was born in Harlem, New York. Powell earned a Bachelor of Science degree in geology from the City College of New York in 1958 and a Master of Business Administration degree from George Washington University in 1971. While at City College, Powell joined the Reserve Officers’ Training Corps and after graduating received a commission as an Army second lieutenant. For the next 35 years, he was a professional soldier holding a variety of command and staff positions and rising to the rank of General. From 1987 to 1989, he served as National Security Advisor and from 1989 to 1993 Chairman of the Joint Chiefs of Staff, the highest military position in the Department of Defense. In 1997, Powell founded America’s Promise with the objective to help children from all socioeconomic sectors by providing “ongoing relationships with caring adults/parents, mentors, tutors, or coaches; safe places with structured activities during nonschool hours; healthy start and future; marketable skills through effective education; and opportunities to give back through community service”. 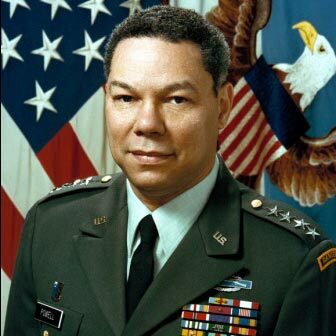 In 2001, President George W. Bush appointed Powell United States Secretary of State, a position he held until 2004. Powell has received numerous honors and awards, including the 1991 NAACP Spingarn Medal, the Presidential Medal of Freedom in 1991 and again in 1993. In 1998, he was awarded the Sylvanus Thayer Award by the United States Military Academy for his commitment to the ideals of “Duty, Honor, Country” and in 2005 he received the Bishop John T. Walker Distinguished Humanitarian Service Award for his contributions to Africa. Powell published his autobiography, “My American Journey,” in 1995.